Redlands East Valley junior linebacker Jaelan Phillips received two offers this week. Phillips received an offer from both Colorado and Nebraska to compliment the offer he received this summer from Washington. “It’s just really humbling and a true blessing to have the opportunity to play Division 1 football especially from such prestigious programs,” Phillips said. While he has interest from Pac-12 programs, such as Colorado and Washington, the linebacker does have a dream school in mind that happens to be within the conference. 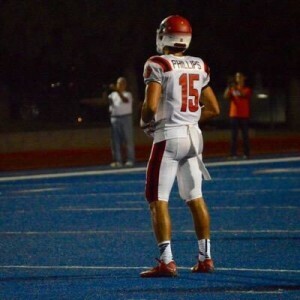 With the experience from last year’s CIF State Championship season, Phillips knows he still has time to improve on the fundamentals of the game. This entry was posted in football, Redlands East Valley High, Redlands East Valley High School and tagged CIFSS, football, Jaelan Phillips, Redlands East Valley by James H. Williams. Bookmark the permalink.